Your cat’s happiness is greatly influenced by how you behave and what kind of lifestyle you offer – as the cat is a territorial species, the environment is everything! First of all, therefore, you need to get the cat-related equipment and facilities right, particularly if you keep your cat exclusively indoors or give it restricted access outside. Even if you haven’t made the decision to have a house bound cat, you may have to confine yours indoors due to ill health or have one that chooses to only go out occasionally because it is nervous or getting old. Having said all that, there is no reason why the following suggestions for a cat friendly home shouldn&apos;t apply to all pet cats, even those with free access to outdoors! Your cat’s ability to choose, based on personal likes and dislikes, is compromised when you are in sole charge of making the decisions, such as where your cat feeds or where it goes to the toilet. If you base those decisions on purely human considerations (or what you perceive to be important to your cat) then you could be making the cat’s life a little less than perfect. As cats have such specific needs it isn’t enough just to provide some food, shelter and love. While these elements are as important as ever to your cat, it is the quality and quantity of each that is the key. There are practical challenges about the provisions you make for your cat in the home: What sort of cat bed should you provide? Where should you locate the scratching posts? What sort of litter facilities would your cat want? A cat friendly home takes into consideration the needs of the cat as a very different species to man. It provides an environment that is safe and stimulating. Most homes are not necessarily the ideal habitat for a domestic cat, so provisions have to be made to cater for their specific needs. You may have heard the phrase ‘environmental enrichment’ with regard to keeping a cat happy indoors. This basically means making provisions within a cat&apos;s confined environment that stimulate and challenge and enable it to perform natural behaviour. Living indoors almost automatically deprives a cat of the ability to behave naturally and experience the challenge and frustration that occurs in an outdoor lifestyle. 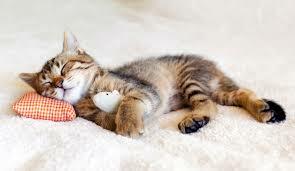 Indoor cats will adapt to their environment but can fall victim to a number of physical or emotional problems associated with boredom and lack of activity. In the absence of the challenge of hunting, exploring and social contact, cats will fill the void of activity with those that are readily available such as sleeping, grooming and eating. It is no coincidence that indoor cats develop physical problems associated with a sedentary lifestyle, for example urinary tract disease, over-grooming problems and eating disorders. A cat-friendly home is about compromises that you can make so that the environment suits you both. However, if you are a lover of contemporary minimalistic interiors you are probably going to have to adjust more than most to provide everything your cat needs. Open-plan living spaces with clean lines and an overall lack of clutter may be the basis of the modern style, but this couldn’t be further removed from your cat’s natural habitat. Although the domestic cat is highly adaptable to most landscapes, it still requires a degree of camouflage to enable it to roam relatively inconspicuously. This camouflage can be found almost anywhere apart from the contemporary living space; it is very hard to disguise a cat in an empty room! The slightly more cluttered home is a haven of possibilities for a cat, offering high places to sit and plenty of places to disappear from view. Indoor vs Outdoor Cat ? What Is Good For Your Kitty? 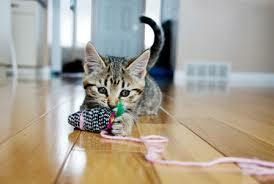 While it is essential to stimulate and challenge cats within the home there is also a duty of care to keep them safe. There are many household appliances, features and products that could be potentially dangerous. It is important therefore to ‘risk assess&apos; the home on a regular basis to keep these dangers to a minimum. There is a happy medium however between overwhelming anxiety about all possible risks and a casual laxity. An owner&apos;s constant concern for the wellbeing and safety of his or her cat can cause it to develop a sense of helplessness and inability to function normally without the owner present. Equally, an irresponsible attitude to safety by the owner could lead to a tragic accident. While discussing safety it is worth mentioning the greatest challenge to the cat&apos;s perception of security in the home. If cats have any access outdoors it may be facilitated via a cat flap. Cats often see the flap as a vulnerable point in the defences of their home where any invader could potentially gain access. This can lead to a state of constant vigilance and uneasiness and a definite compromise to the individual&apos;s sense of safety in the home. (Click here for information on how to choose and using a cat flap) If your cat has restricted access outside, or chooses to venture out only in your presence, it may be preferable to dispense with the cat flap altogether. Otherwise it would be sensible to locate all your cat’s important things well away from this potential danger zone. In order to provide a cat friendly home you need to understand the objects or provisions within it that your cat considers important. These ‘resources&apos; should be available in sufficient number and type to appeal to even the most discerning individual. ‘Resources&apos; within the home represent all those things that provide nourishment, entertainment, stimulation and security for your cat. Some of the essential provisions are often taken for granted but even food can be offered in a cat-friendly way. You have numerous food bowls to choose from - ceramic or glass food bowls are probably the most sensible choice as plastic receptacles scratch easily and can give off a slight odour that your cat may not like. Stainless steel is hygienic and easy to clean but, if your cat wears a collar, the constant clink of any disc or bell against the metal can be very off putting. The bowl size or shape is dependent on your own personal taste, although many cats can be messy if eating from a flat plate and prefer to push food around a bowl that contains the food better. The only exception to the plate rule is the Persian or any breed with a flat face that may prefer theirs as shallow as possible. Cats would naturally spend up to six hours a day foraging, stalking, catching and consuming prey. They would eat ten or more mice a day, probably involving about thirty attempts at capture. Therefore the predictable availability of food only twice a day in a food bowl in the kitchen does not represent any kind of challenge whatsoever and leaves the average pet cat with a void of several hours that it would need to fill with other activities. The majority of owners always provide water in the same location as the food bowl. Cats naturally hunt for food and search for water on separate occasions to satisfy either hunger or thirst. The presence of water near the food can actually deter some cats from drinking sufficient fluid, particularly if they are on a dry diet. Finding water elsewhere can be extremely rewarding and there should be at least &apos;one water container per cat in the household plus one extra&apos; in various locations away from food. 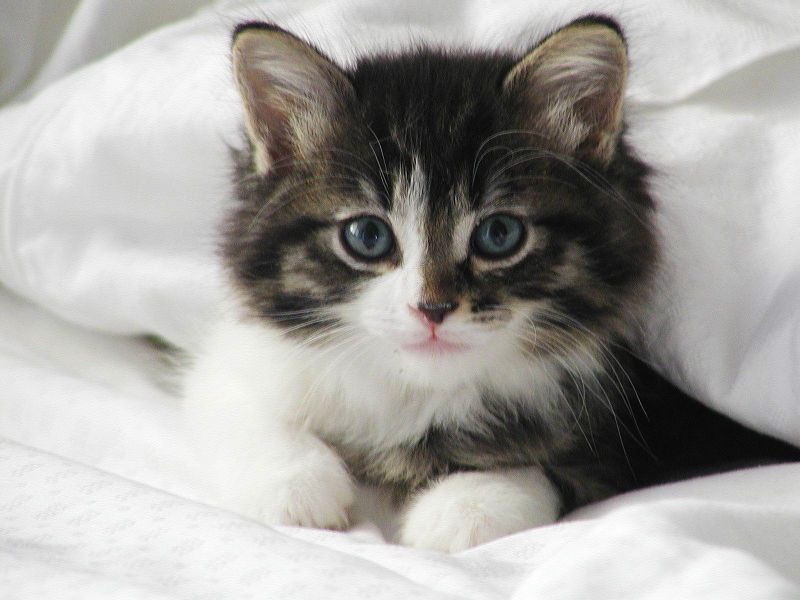 Some cats object to the chemical smell from tap water so filtered or boiled water can be used. Pet drinking fountains and even glass tumblers are popular drinking vessels for cats but regular bowls can also be attractive if they are presented appropriately and are large enough that your cat can drink without touching its whiskers against the sides. Cats like the bowl to be full to the brim so that they can lap without putting their heads down. Cats are natural climbers and it is important for your cat to be able to rest and observe its surroundings from high places. It’s hard to beat a staircase in a home as this gives access to a ‘high place’ and perceived safety. If your property is single storey then your cat’s instinctive need to jump up high when in danger has to be fulfilled with shelving, cupboards or other possible platforms. Any high resting places provided should be located in such a position that the cat is able to get down; it is always easier to climb up! • Free standing cupboards and wardrobes have large areas where a cat can rest or hide in a high place. It may be necessary to place furniture nearby to give the cat a halfway platform for ease of access. • Shelves can be constructed specifically for the cat&apos;s use. It is important to provide a non-slip surface as many wooden shelves are extremely slippery. Bookshelves and other shelving can also provide sanctuary if a small area is cleared for your cat&apos;s use. Keeping expensive breakable ornaments on shelves or mantelpieces is not advisable! Taking time out from social demands is an essential part of everyday life for a cat so secret hideaways are an important facility. These can be created by making space available under the bed, inside cupboards or wardrobes or behind the sofa, for example. Your cat should never be disturbed while using a private area unless you have any reason to believe that it may not be well. If you make your cat’s private place a warm one too, like the bottom of the airing cupboard, you are providing five-star accommodation! Cats spend the majority of their time asleep so it makes sense to focus on what provisions you are making for your cat’s rest and relaxation. Cats favour warm places to sleep and many prefer them to have a strong familiar scent of their owners to give a sense of safety and security. Not all cats need the reassurance of their owner’s smell when they are resting so they may have several sleeping locations that rotate according to the position of the sun. An assortment of beds should therefore be provided in warm, sunny, quiet or communal areas. These don’t have to be special beds designed for the purpose as the average cat is perfectly content with its owner&apos;s bed, chairs or sofas, so you may wish to place some warm bedding on your furniture in your cat’s favourite sleeping spot. Make sure any cat bedding provided is washable but don’t clean it too frequently, unless heavily soiled, as cats gravitate towards surfaces with a familiar scent. Radiator hammocks are great for those heat-seeking cats (Siamese and Burmese for example); they hook onto a radiator to enable the cat to gain the maximum benefit from the heat but do remember to keep the radiator on a fairly low setting! If you want to purchase a cat bed then positioning it appropriately may be the key to its appeal. Place it in a raised position (many cats feel a little vulnerable sleeping on the floor) near a source of heat or an area in sunlight. If your cat likes its own space then ensure beds are provided in quiet areas away from thoroughfares. Those with three high sides that surround the cat will keep draughts away and give a sense of camouflage to avoid attracting attention (even a cardboard box with some thick bedding would also do the trick). Your bed is potentially the ultimate delight for your cat - with the warmth of a duvet and a strong smell of you! This provides a tremendous sense of security and enables your cat to sleep deeply in the knowledge that it is safe. If your bedroom does become an important resource however it can also be a place of conflict if you have a multi-cat household as individuals compete for the best spot. Providing heated pads or raised cat beds in other bedrooms or even allocating space in your own room for such additions may go some way to finding a sensible compromise. Litter trays are a necessary evil, absolutely essential if your cat is housebound or has limited access outdoors and highly recommended even if your cat is free to roam. The position of the litter tray is important. It should be located in a discreet corner, away from food and water, full-length windows and busy thoroughfares. Cats may see external doors and cat flaps as potentially dangerous places so locating them as far away as possible from these stressful areas would be ideal for your cat. One tray for every cat in your household, plus one extra ideally should be placed in different discreet locations away from food. This doesn’t mean that each cat will automatically choose their own tray but it will give a general sense that there is plenty of choice. These trays can be covered or open but it is important that the areas they are located represent a place of safety where the cats don’t feel vulnerable. A regular cleaning regime is essential, removing faeces and urine soiled litter at least once a day and cleaning the entire tray weekly. Some cats find polythene tray liners unpleasant, particularly if they spend a lot of time scraping in the tray, as this could result in them getting their claws caught in the liner. Litter deodorants can also introduce a strong alien smell into the tray, so you may find your cat prefers a well maintained tray without any added fragrance. Cats need to scratch to maintain their claws and mark their territory. If provisions are not made for this then cats will scratch items of furniture. Scratching posts should be as tall as possible to allow your cat to scratch vertically at full stretch. Panels can be attached to walls at the appropriate height if space is at a premium. Some cats prefer to scratch horizontal surfaces so a variety of scratching areas should be provided. 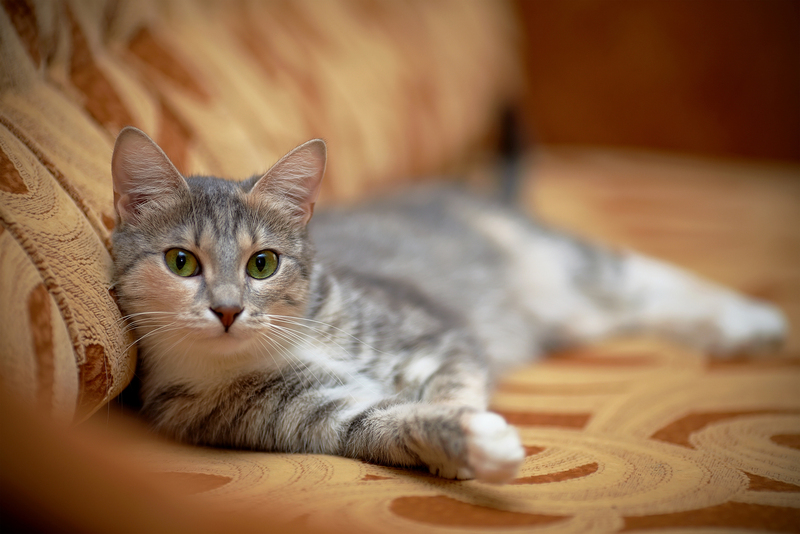 Many cats enjoy the company of their own species, under the right circumstances, and some sources of advice actively encourage owners to acquire more than one cat when keeping them indoors. However problems can arise when the individuals reach social maturity (usually between the ages of eighteen months and four years) and find themselves competing for limited resources within a territory that is relatively small. These problems can potentially be minimised by providing plentiful resources in the home and keeping the appropriate number of cats for the size of property. A commonly quoted formula to calculate the appropriate number of resources is ‘one per cat in the household plus one extra, placed in different locations’. There is no formula for the recommended number of cats per square metre floor space but common sense should prevail. Keeping seven cats in a two-bedroom flat for example is asking for trouble! Townhouses also represent a uniquely challenging environment for cats with the narrow staircases leading to each floor becoming areas where conflict can often occur. Social contact with humans is important but the level will vary according to the personality of the cat. It is best to allow your cat to dictate the level of interaction and to initiate most of the contact. Owners that are constantly approaching their cats for petting can cause irritation or, occasionally, distress. Predatory play, grooming and verbal communication represents important social contact between owner and cat and is often better received than ‘kissing and cuddling&apos;. Some cats enjoy the company of dogs also so company can come in different forms! Every cat is an individual but most prefer toys and games that are as close to the natural hunting experience as possible. Toys that move randomly are great; those that are motionless and left lying around soon become predictable and boring. Toys made from fur material or feathers that are of a similar size to prey animals are popular, as are those impregnated with catnip - a herb that cats can find particularly attractive. All should be stored away and brought out from time to time to maintain their novelty. Many cats enjoy retrieval games and this can represent an opportunity for social contact as well as play. About two-thirds of cats respond to the smell of catnip (dried catmint Nepeta cataria) which can produce a temporary euphoric state in cats. If it is used sparingly it is a fun distraction. Catnip toys can easily be made at home and used to good advantage for ten minutes a day or every other day, for example. Bags of dry catnip can be purchased which tends to be more potent than catnip sprays or treats. It’s good for house cats to be exposed to new things every now and then, otherwise a constant, unchanging environment can become too predictable and some might then find new experiences or situations stressful. New items can be brought into the home on a regular basis to challenge your cat&apos;s sense of smell and desire to explore novel things. Wood, stone, plants, cardboard boxes or paper bags, for example, can be placed in various locations and left for your cat to decide whether or not they are worth exploring. Even for those cats that don’t go outside, it’s still important that they are regularly vaccinated and treated for parasites, as items could potentially have been in contact with other cats. Stimulating your cat&apos;s senses is extremely important and this also includes novel sounds but beware playing loud music; a cat&apos;s hearing is extremely sensitive and this could be distressing. Windows are a significant viewing point for the great outdoors but, contrary to most people’s understanding, cats usually prefer smaller windows in darker rooms if given the choice. Large expanses of glass appear to be confusing to cats; they see the garden or the street outside and all the potential dangers that they harbour, but fail to grasp that they are safe indoors. It all comes down to camouflage. Glass does not give the cat any opportunity for concealment while it checks out the territory and if it is full-length then the ultimate horror may occur and a cat may come face to face with next-door’s tomcat on the other side. If you think this could be a problem for your cat then you might want to consider attaching sheets of decorative static film (no adhesive needed) to the lower portion of full-length glass that opaque the view but still enable the room to remain light. To your cat this will look like a more solid defence. In conjunction with this you can ensure your cat has a high perch somewhere near the window from which it can view the outdoors from a position of comparative safety. If you don’t fancy putting any film over a full-length window then the strategic positioning of potted house plants near the glass may just be enough camouflage for your cat to feel a little safer. Don’t underestimate the value of fresh air, particularly if there is a smoker in the house. Grills over your windows, either home-made or purchased specifically for the purpose, will allow fresh air to enter your house. This alone will carry challenging and interesting smells from outside and be a focus of attention for a bored house cat. The ways that an environment can be enriched for a cat are many and varied based on the principles described about; you are limited only by your imagination! An understanding of the provisions necessary for a cat friendly home will ensure that your cat remain as happy and healthy as possible.